Temperature based leak detection is based on Silixa’s Distributed Temperature Sensor (ULTIMA™ DTS) offering multiple channel configurations up to 35 km per channel on either single mode or multimode fibre. Acoustic leak detection is based on the intelligent Distributed Acoustic Sensor (iDAS™) with a range of tens of kilometres without using repeater stations. The system enables high quality synchronized coherent digital recording of acoustic waves, with no cross-talk, at every location along the fibre. Optical fibre distributed acoustic and temperature based systems enable leak detection along the total length of the optical fibre cable under different operating conditions. Both technologies can be used in parallel or independently depending on the operational constraints of the asset being monitored. Distributed Temperature Sensor (DTS) based systems can be adapted to cases where large temperature gradient and slow or creeping leaks are expected whereas the Distributed Acoustic Sensor (DAS) system can be adopted in systems under high pressure where a fast response is expected. Thermal leak detection works by detecting a localised change of temperature at a point on an asset induced by a release of the contents into the surrounding environment. For liquids, such as oil, this is usually a rise in temperature whereas for high pressure gases this is a drop due to the Joule-Thompson effect. Modern asset management calls for continuous data on the operating conditions and status of the asset being monitored. Additionally, the user needs to be informed of any anomalous events detected either within or near the asset. Distributed fibre optic sensing delivers a wide range of operational information with a measurement density not achievable using conventional technologies and gives 100% coverage of the asset being monitored. Additionally, the information is delivered with positional data that provides the operator with a detailed view at a sub-metre scale. Distributed fibre optic sensing can deliver valuable temperature and acoustic information. This data can be further used to alert the operator to specific events such as leaks, slug detection, cable break and 3rd party intrusion. Silixa’s DTS delivers temperature measurements with the best temperature and spatial resolution on the market. Our iDAS captures true acoustic, enabling advanced detection of algorithms to be used to discriminate between events and position them accurately on the asset. 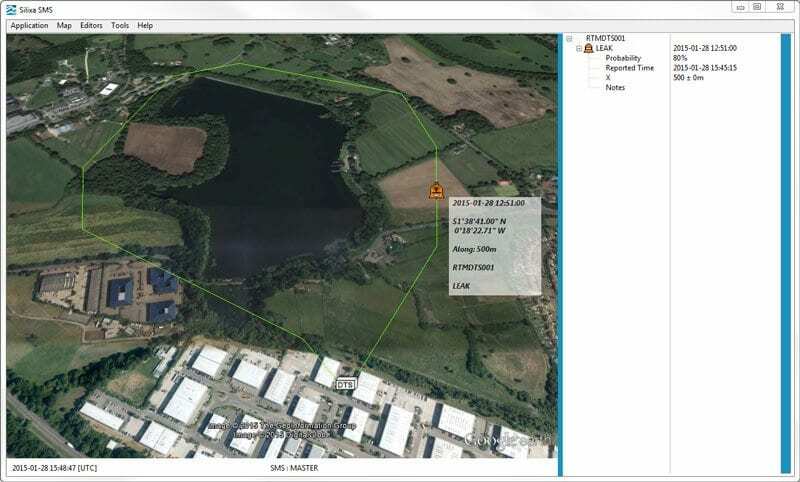 Alarms are managed through the Surveillance management application with a graphical interface showing the schematic layout of the asset or a map representation on a customised screen. On receipt of a warning, a message will alert the operator, and a marker will indicate the type of event and highlight its location on the asset schematic. The operator will be presented with further information in the alarm window that includes the, time label and location. Every alarm will receive a unique alarm ID and all data associated with the alarm (including the signature data and operator notes) are stored locally on a database. Further integration with client systems is implemented through the customisation of the user interface. All the information, including GPS position, relating to a leak alarm is displayed on a clear user interface. In addition to displaying the alarms, the user can manage and record responses to the event through the screen.